...might it look like this? The page was developed by Heather Snyder and Anna Heran, of the staff of the Lloyd Library and Museum, Cincinnati, in consultation with Nik Money, professor of biology at Miami University and a Lloyd board member. Just like a real Facebook page, it will be updated from time to time by the addition of new friends and comments. Thanks to Anna Heran for posting the link, as well as a press release, on the Archives & Archivists listserv maintained by the Society of American Archivists, and to my wife for forwarding it to me. I read Portrait of the Artist as a freshman college English assignment, and found it an interesting, if challenging, contrast to the fiction, mostly Steinbeck and Sinclair Lewis, I'd been reading at the time. 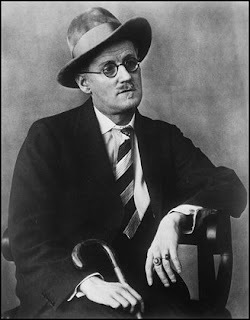 I didn't return to Joyce until my thirties, when, on the recommendation of a friend, I read Dubliners. I liked the stories, especially "The Dead", very much. It wasn't until I was in my forties, though, that I tackled Ulysses, although I'd seen Joseph Strick's and Fred Haines' excellent 1967 movie adaptation while in law school (and heard the conclusion of Molly Bloom's soliloquy recited by "Ralph Spoilsport" on Firesign Theater's How Can You Be in Two Places at Once When You're Not Anywhere at All? many times after that). Ulysses was tough going for me. I read it in small chunks, mostly while commuting on the subway. The "nighttown" sequence was particularly difficult. Once I got through it, though, I was glad I'd made the effort. It helped to make more enjoyable my visit to Dublin several years later. There's a nice appreciation of the book by Colum McCann in today's New York Times, in which he tells how it helped him to understand his deceased grandfather, a man of Joyce's time and, in his younger days, of the Dublin of Ulysses. As for me, if I may be excused, I'm off to search for Gerty MacDowell. 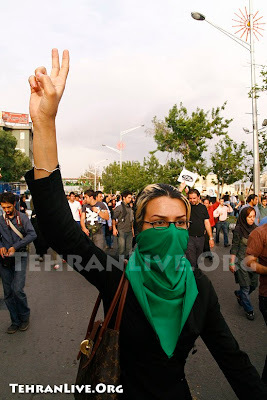 Thanks to friend Geoff for sending me a link to Tehran24, which provides photos (the image above is taken from the site), video and text concerning events there. A post from Sunday, June 14, says the site has been "banned in Iran by government since three hours ago"; however, it is apparently still operating, as new posts went up yesterday.